Like Jell-o, there’s always room for video game football: When your team is doing well, you play to celebrate the excitement of the game, and your team’s success at it. When your team is having a miserable season, like my beloved Philadelphia Eagles, you play to give your team the fantasy season it deserves, crushing rivals and—inevitably—winning the Lombardi Trophy. 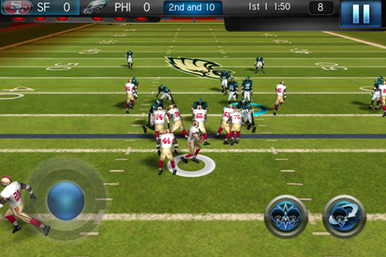 Fitting a football game on the iPhone’s small screen is no simple feat. Making it fun to play is harder still. NFL Pro 2012 succeeds on both fronts, but the overall gaming experience is marred by something worse—endless annoyance, with a greedy undertone. NFL Pro 2012 is free—barely. But we’ll get to that later. The game launches with a tutorial, and you’re rewarded with in-game credits throughout the tutorial as you complete different drills to master the controls. 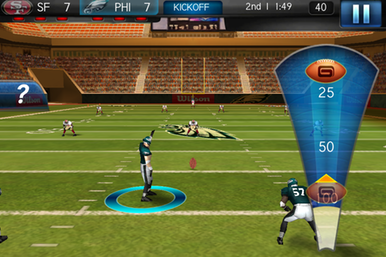 Ball Control: NFL Pro 2012 employs the standard iOS sports gaming approach of a virtual d-pad on one side, and contextual action buttons on the other. The games controls are fairly typical of iOS football simulators: You use a virtual d-pad to move your player around, and contextual action buttons on the right to trigger moves like sprinting boosts, spin moves, and trucks. A clever control for getting off blocks requires that you hold down the button until the constantly looping meter is full, releasing it just at the right moment. I found that the virtual d-pad felt a bit loose; my players didn’t always move in the direction I seemed to be pushing on the first try. I could always get things moving the right direction again, so that didn’t faze me much. Less stellar are the accelerometer-based controls. When your quarterback is behind the line of scrimmage, you rock the iPhone back and forth to switch him into scrambling mode. I found that this mostly happened when I didn’t want it to, and that there was then no obvious way to get the quarterback back into passing mode again. The few times I intended to scramble, I spent so long trying futilely to rock my iPhone the right way that I ended up getting sacked. A similar rocking gesture—only this one’s side to side—is meant to trigger evasive jukes. It works, but I’m never a fan of angling the iPhone away from myself in the middle of a play. Kicked Off: One day, an enterprising iOS developer will devise a more fun way to trigger virtual kicks. As in most football simulations, the kicking game isn’t especially fun. It’s the standard, uninspired slider control you surely expect. NFL Pro 2012 offers an at-times confounding mix of advanced options and missing features. You can call audibles, draw pre-snap hot routes for receivers, and make last-second defensive adjustments, for example, but you can’t run a hurry-up offense or rush your players to the line after breaking the huddle. I could find no option for an onside kick, either. The game looks impressive, taking full advantage of your Retina display, if you have one. Some animations got repetitive, especially the stretching moment that every returner spends a couple seconds performing before each kickoff and punt. A few times, computer-controlled players ran in robotic lockstep. But on the whole, NFL Pro 2012 looks sharp and doesn’t drop frames. The audio’s good, too; the automated play commentary is less repetitive than in Madden NFL, which is nice. It’s when you start calling plays that things get unpleasant. (Of course, you call plays between every single snap, so the unpleasantness becomes rather routine.) That’s because much of the game’s playbook is locked behind upsells. Perhaps, on offense, you’ll want to call a long pass. NFL Pro 2012 might indicate that long pass plays aren’t available, unless you want to pony up some amount of in-app credit. Rates very, but unlocking one deep passing play in the playbook may cost five in-game credits—for a single play. It may cost 50 credits to unlock that play for the entirety of the game, or 250 credits to unlock the play forever. 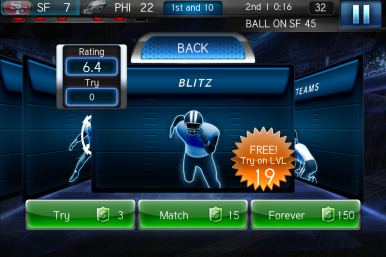 Pay to Play: NFL Pro 2012 locks much of the playbook behind in-app purchases. You can earn in-game credits to pay for them, if you're tremendously patient. Your only other option is to pony up cash. You can get credits in two ways: One method is to slowly accrue credits through successful gameplay, which is extra challenging given that you’re starting from a severely handicapped playbook. (On defense, I started with unlimited access to zone defenses, but none to blitz or man-to-man packages.) Credits accumulate painfully slowly in this fashion. Sometimes, you get to try a fee-based play for free, but then you can’t use it again (unless you pony up some credits) until five real-world minutes are up. Speaking of the real world: The other option for getting credits more quickly won’t surprise you—it’s cold, hard cash. You can buy 400 credits for $2, or 15,000 credits for $50, or credit packages at various price points in between. I would gladly pay $10 or $14 for an unhampered version of NFL Pro 2012. I don’t know how much cash it would take with the in-app purchases to unlock every play and feature, but I know that $50 is as much as a much more full-featured console football game, and an iPhone-only football simulation doesn’t seem worth quite that much to me. In addition to the limited playbook, NFL Pro 2012 allows you to play as only a single team, unless you pony up credits to unlock other teams (or divisions, conferences, or the entire league). You might also spend credits on stadiums and in-game experience points. Earning those in-game experience points actually becomes a bit grating. On a long punt return for a touchdown, NFL Pro 2012 celebrated each ten years during the runback. That is, a sound effect and on-screen animation heralded my steady progress on the return, as my ever-increasing scramble merited more and more experience points. I appreciate the enthusiasm, NFL Pro 2012, but just let me run the ball in, and then we can cheer for me. Still, that particular criticism is a minor one. In truth, I find that NFL Pro 2012’s gameplay is at least as fun as Madden’s, and outshines Madden’s overall control scheme. I like the graphics in NFL Pro 2012 a bit more, too. But with Madden, you pay for the game once, and then you own it outright. All of it. In short, while NFL Pro 2012’s gameplay is impressively, the incessant nickel and diming is anything but. I believe the game is a clear case of taking the freemium model too far. Were there a single, reasonably-priced option to unlock the complete playbook, my rating would be a full mouse higher.